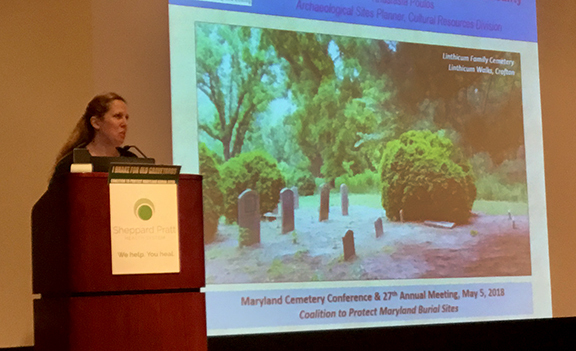 President Eileen McGuckian called the 27th Annual Meeting of the Coalition to Protect Maryland Burial Sites to order at 9:15 a.m. on May 5th at the Sheppard Pratt Conference Center, in Towson, Baltimore County, Maryland. 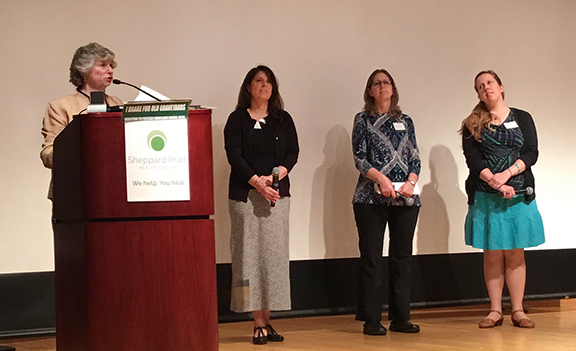 Sheppard Pratt Health System is the largest and a top nationally-ranked nonprofit provider of mental health, substance use, special education, and social support services in the country, spanning both hospital- and community-based services. Founded in 1853 by Moses Sheppard, the institution admitted its first patient in 1891. Sheppard’s vision of an institution that treated patients with respect and dignity was shared by Enoch Pratt, a wealthy merchant and philanthropist who left an endowment for The Sheppard Asylum upon his death in 1896. SPHS’s lovely Towson campus is home to several unique art and history exhibits that are open to the public. Throughout the public spaces and within The Gibson Museum you will find work created by professional artists who have been impacted in some way by mental illness or addiction. Visit www.sheppardpratt.org. President McGuckian welcomed the 58 members and guests in attendance and gave a brief summary of the current status of cemetery preservation and legislation in the State of Maryland. Since our last conference, two important bills (HB 877 and SB1242) were passed by the Maryland General Assembly offering easier access for descendants and caretakers with written agreement, proper direction for conservation treatment at cemeteries over 50 years old, through the Maryland Historical Trust, and authorization for counties and towns to provide property tax credits related to burial sites. 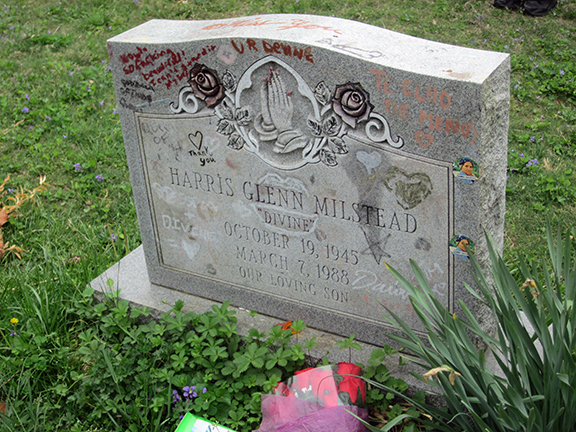 Although many Maryland cemeteries remain neglected, vandalized, abandoned, and forgotten, in general burial sites advocates can claim progress during the past year. The Coalition continues to serve as a resource to anyone who cares about cemeteries, every week throughout the year responding to phone calls and emails, conducting site visits, wielding chain saws, organizing clean-ups and mapping sessions, and providing follow-up assistance. Our redesigned website is accomplishing much of what we hoped it would. 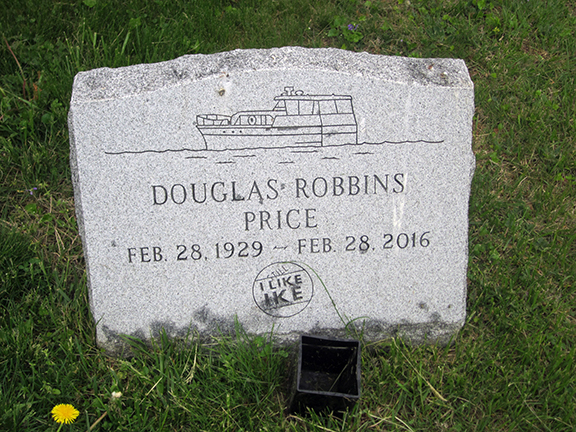 It has become a resource for cemetery owners, family members, volunteers, and communities. It has increased public awareness and provided tools and strategies to protect and preserve burial sites. Last year began with Preservation Maryland selecting “Historic Maryland Cemeteries” as a Six to Fix project and led to improvements that upped the Coalition’s game with organizational strength, messaging, and visibility. 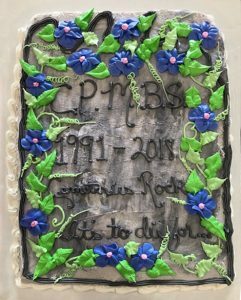 The year ended with an incredible day at two Charles County cemeteries, where nearly 100 volunteers conducted research and oral histories, took inscriptions, scanned documents, assisted archaeologists to mark gravesites, and helped a conservator repair markers. The partnership with PM helped to move cemetery issues into the mainstream of historic preservation. CPMBS continued advocacy at State and local levels. Our major focus was on strengthening State protections, with some success. We started meeting with legislators last summer and kept up the pressure until the final day of the session on April 9. David Zinner, Natasha Mehu (MD Association of Counties) and Eileen McGuckian met multiple times with Del. Tony Knotts (Prince George’s County) to develop a 10-point proposal to strengthen cemetery protection and preservation titled “Maryland Cemetery Preservation Act of 2018.” This proposal emerged from Bill Drafting as HB 877 and was assigned to the House Health & Government Committee. Senator Joan Carter Conway of Baltimore City filed SB 1242 on the other side. Supporting groups turned out at hearings, and citizens from all over Maryland sent emails, letters, and phone calls to persuade representatives to vote both bills favorably out of committee. [See article on www.cpmbs.org] On the very last day of the session, April 9, the final votes were cast. All votes in 5 committees and on the floors of both houses were unanimous! By May 5, only needed to become Maryland law was Governor Hogan’s signature. Kristin Kraske keeps track of who’s paid dues and often reminds us that we want to keep them affordable to all. We currently have 114 members, with 31 new members just this past year! Dave could not attend today; report from him that the Coalition’s current net worth is $17,974.28. Dave Mills served well as our treasurer for several years. Unfortunately, Dave tendered his resignation a couple of months ago and we are in need of an individual for this vital position. If you have financial skills, please consider contacting us immediately. When we had an opportunity in 2015 to determine how best to use a legacy from former president Jim Trader, we created the Trader Foundation for Maryland Burial Sites. It is a nonprofit to which contributions are tax deductible and are used to provide financial assistance for worthy cemetery projects in Maryland. Glenn Wallace, Trader Foundation board secretary, presented the current status. To date, there have been 12 applications and 10 awarded grants totaling over $11,000. The next application deadline is July 1, 2018. PANEL PRESENTATIONS: “Local Government and Cemetery Preservation” Three panelists, Beth Burgess, Howard County (Resource Conservation Division Chief), Anastasia Poulos, Anne Arundel County (Archealogical Sites Planner, Cultural Resources Division – Office of Planning and Zoning), and Jennifer Stabler, Prince George’s County (Archeology Planner Coodinator, Historic Division, M-NCPPC), discussed the processes and procedures associated with each county and how each addresses issues and challenges to preserve burial sites in their jurisdictions. 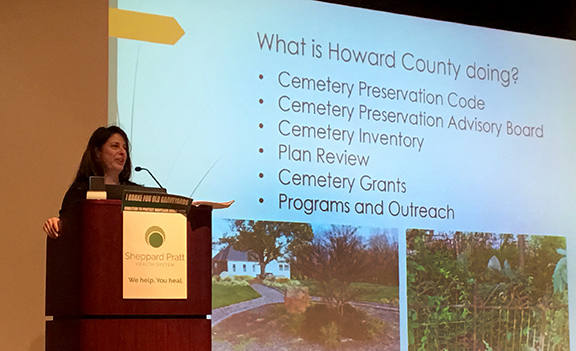 Ms. Burgess described Howard County’s cemetery preservation codes (Title 16, Subtitle 13), cemetery advisory board, and plan review process, council-approved cemetery inventory, and grants they have received. Ms. Poulos discussed Anne Arundel County’s code (Article 17), compliance review process, grant writing, and non-profit support. Ms. Stabler explained her role with the Maryland-National Capital Park and Planning Commission and the development of the historic development plan of Prince George’s County. 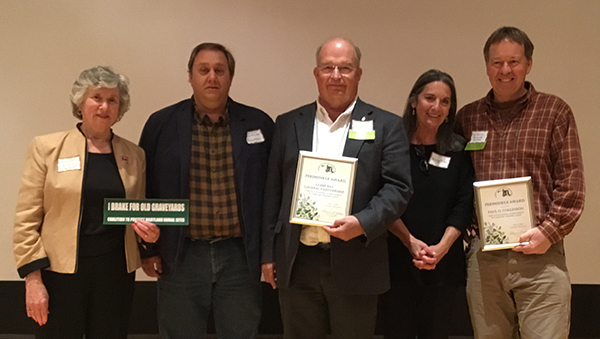 Glebe Bay General Partnership — for its approach to preserving burial sites within its developments, specifically Glebe Heights Assemblage, in Mayo, Anne Arundel County. Award was presented to James Glascock, principal of Glebe Bay Partnership. Paul O. Collinson — for rehabilitation of two historic Maryland burial sites, the Collinson Family Cemetery in Mayo and the Magruder Family Cemetery in Bowie. OPEN FORUM AND GROUP DISCUSSION During lunch, attendees described their specific cemetery situations… concerns, interests, accomplishments, help needed. This generated considerable ideas, offers of assistance, and networking around the room and for the rest of the day. A suggestion was brought forth to have the Coalition underwrite the purchase of a ground penetrating radar (GPR) system to have on-hand for cemetery investigations. Details involving its purchase and training will be discussed by the Board of Directors at its next meeting scheduled in June. Attendees also visited the silent auction offerings organized by Sandra Wright and the gift shop organized by Amanda Becker. VISIT TO PROSPECT HILL CEMETERY Originally part of the Hampton estate of Charles Ridgely, this 6-acre oasis amidst the now-commercial heart of Towson, is located on one of the highest points in Baltimore County and has a lovely view of the Dulaney Valley. The site may have been used for Chew family burials as early as 1856. In operation since the 1890s, this community cemetery contains more than 3,000 burials, including actors, physicians and nurses, public officials, farmers, a Baltimore Colt, engineers, veterans of every war beginning with the American Revolution, as well as Babyland, where over 100 infants and young children rest. In 1984, when the cemetery was in disrepair, a group of Towson families formed a new nonprofit to manage the perpetual care cemetery, sell lots, and conduct burials. www.prospecthilltowson.org. 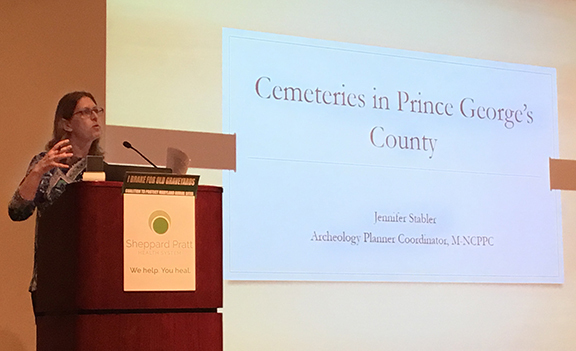 The 2018 Maryland Cemetery Conference and Annual Meeting was adjourned at 3 p.m.